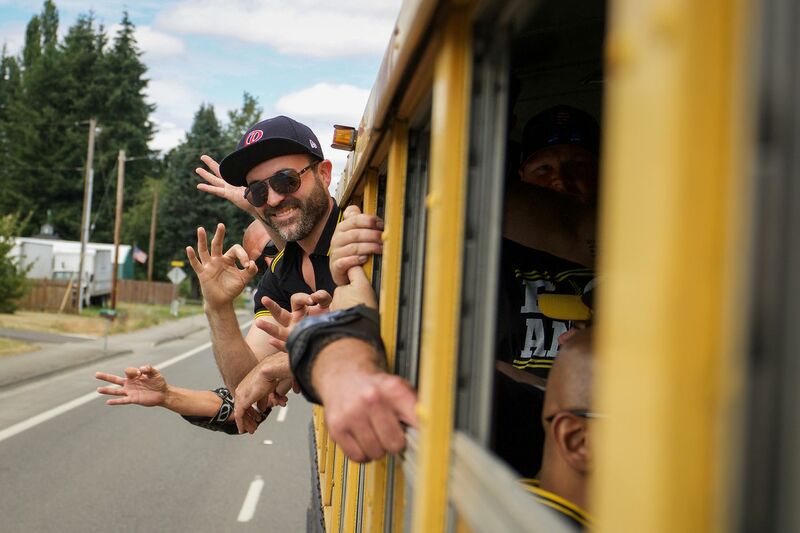 The Proud Boys make their signature hand symbol while riding to a rally in Portland, Oregon. They also use the signal to communicate with each other in the midst of a fray. PORTLAND, Ore. — Behind the anonymity of white faces illuminated by tiki torches, beyond the bloodied fists of street brawls, there are communities of young men who gather on weekends to camp and fish and train in combat sports. The face of hate is changing in America, and the new right is a "millennial male phenomenon," said Heidi Beirich, director of the Intelligence Project at the Southern Poverty Law Center in Montgomery, Ala., an advocacy group that tracks hate and bigotry toward marginalized communities. Brewing among some young men are an intolerance and hatred bringing bias-motivated violence to the streets and white-nationalist politics to the political forefront. Beirich said many such groups have toned down their rhetoric and tactics since the violence of the 2017 Unite the Right rally in Charlottesville, Va. But she pointed to two groups, very different in their objectives, that "are still growing and making noise": the Proud Boys and Identity Evropa. Members of the right-wing activist group the Proud Boys ride their old school bus to a rally and march in downtown Portland, Ore. The Proud Boys call themselves “Western chauvinists” and attend conservative rallies to protect other demonstrators from left-wing counterprotesters. Both groups are young, male-dominated, and positioned on the far right. Both formed in 2016. The Proud Boys are composed of blue-collar workers in their 20s and 30s whom the SPLC label as anti-Muslim and sexist. The Proud Boys call themselves a men's drinking club, extreme patriots who believe "being proud of Western culture today is like being a crippled, black, lesbian communist in 1953." Identity Evropa is made up of mostly college-educated white men in their 20s and is labeled a white-nationalist hate group by the SPLC. Their goal is to enable a white supermajority in America by bringing their political ideas mainstream and expanding their political and social influence, according to the group's current leader, Patrick Casey. "Identity Evropa's message is pro-white, white ethnostate, and this is a racist conception," Beirich said. "Even though they may look good with their polo shirts and nicely painted banner signs, that doesn't mean they are not dangerous." Members of Identity Evropa, many of whom prefer not to be identified, hang their group’s flag. Made up of mostly college-educated white men in their 20s, the organization works to enable a white supermajority in America by bringing their political ideas mainstream and expanding their political and social influence, according to their current leader, Patrick Casey. "No tattoos, no drugs, well-dressed, high-class" is how Patrick Casey, Identity Evropa's executive director, described his ideal recruit. In early July in Philadelphia's Fairmount Park, 10 members of Identity Evropa joined Casey for an afternoon of community service, which the group also calls activism. Before pulling on protective gloves to pick up trash, Casey halted the group of young men to flatten one recruit's shirt collar. Image is everything, and this park cleanup is an exercise in public relations, a way to push Identity Evropa's ideas into the mainstream by being seen as valued members of society. "Identity Evropa. We're kind of like a fraternity" is the response members gave to passersby who wanted to know who they were. "Just doing our bit for the community," they said to a young woman with two children at her side. When two members begin chatting about how they believe mainstream news media are colluding in their coverage of black-on-white crimes, Identity Evropa's chief of staff commanded them to stop talking, his eyes traveling to a journalist's recording device. If Identity Evropa is a fraternity, it's like no other. Dues may not inhibit membership — "$10 a month, the same price as a Netflix subscription" — but the prerequisites might. Members must be white, specifically non-Hispanic, non-Semitic, and of European heritage, Casey said. Members of Identity Evropa pick up trash in Fairmount Park in early July. The park cleanup was an exercise in public relations, a way to push the group’s white-nationalist ideas into the mainstream by being seen as valued members of society. “Just doing our bit for the community,” they said to a young woman with two children at her side. Casey, 29, and his band of identity brothers say they are working to preserve white identity in America. Identity Evropa has gained national attention for the youth of its members, and their presence at last August's Unite the Right rally in Charlottesville, where they led the chant "Jews will not replace us!" while marching with burning torches. After Charlottesville, Identity Evropa lost members and momentum and Casey took over as executive director to rebuild and rebrand the organization as clean-cut and unsullied. The group now claims a membership of roughly 1,000 and a presence at most college campuses around the U.S.
Casey, who also works for the far-right media production house Red Ice TV, told News21 he was raised in a "mildly conservative" home in Virginia, but after researching multiculturalism, immigration, and diversity online, he adopted identitarian beliefs and joined Identity Evropa. "Our national agenda is to place members in elected and powerful positions in order to legislatively advance an end to all illegal immigration into America and to ultimately limit legal immigration to people from northwestern European countries," Casey said. The organization regularly places banners on highway overpasses, with such slogans as "Danger you are now entering a sanctuary city," "End immigration," and "European roots | American greatness." Members stage public protests, recently dressing in construction gear and holding signs reading "Build the Wall" outside the Mexican Consulate in New York City. "You could be studying for a degree in physics, and they'll make you take a diversity class," Casey said, "but diversity just means less white people, and that is really sick." The organization distributes recruitment fliers, stickers, and posters on campuses, frequently drawing the attention of local and national news media, a recruitment strategy Identity Evropa calls "Project Siege." "The idea is that people see the flier and then they look us up online and apply to join," Casey said. Patrick Casey, 29, is executive director of Identity Evropa. “Our national agenda is to place members in elected and powerful positions in order to legislatively advance an end to all illegal immigration into America and to ultimately limit legal immigration to people from northwestern European countries,” he said. After the application, they are contacted by a member of Identity Evropa's interview board and a Skype interview is conducted. Candidates are asked about their heritage, their political ideology, and their views on Adolf Hitler. The Anti-Defamation League's latest report on white-supremacist propaganda on college campuses describes Identity Evropa's tactics as using "propaganda that avoids recognizable white supremacist imagery and language." The ADL recorded 478 incidents of white-supremacist propaganda on campuses since September 2016, including fliers, stickers, banners, and posters. It attributed roughly half these incidents to Identity Evropa. The first line of Proud Boys and members of the group Patriot Prayer walk toward antifa’s “black bloc” who wear black clothing to conceal their identities. Formed the same year as Identity Evropa, the Proud Boys have risen to public prominence particularly for their street brawls with antifa. Antifa, short for antifascist, is not a unified group but a loose collection of local groups and individuals who are aggressively opposed to far-right movements. The Proud Boys see themselves as a men's drinking club whose members moonlight as bodyguards of free speech, particularly for Patriot Prayer, another right-wing group that hosts rallies in the Northwest opposing immigration and political correctness. Antifa, however, consider the Proud Boys a "violent street gang of misogynists, fascists, racists, and bigots," according to one member of antifa. Most antifa members come from the anarchist movement or the far left. But since President Trump's election in 2016, people with more mainstream political backgrounds have joined antifa at counterprotests, according to the Anti-Defamation League. The opposing groups have engaged in fractious civil disputes since early 2017, and videos of their violent encounters shared online have prompted more men to join Proud Boys and more people to attend antifa's protests, both groups said. Proud Boys brawl with antifa along the Patriot Prayer march route shortly before the event was declared a riot and police dispersed the crowds. An unconscious man is dragged away by fellow antifa activists. "This isn't some big political movement," said Gavin McInnes, cofounder of Vice Media and the alt-right provocateur who founded the Proud Boys in a bar in New York City. In a phone interview, he said the group began as a joke, just an outlet for men who wanted to do something, a way to be in society. "In the past, men had an automatic advantage. This is no longer the case, and men are seeing that change in the world," Karla Mantilla, author of Gendertrolling: How Misogyny Went Viral, said in a phone interview with News21. The Proud Boys are dangerous, she said, because "their philosophy is based on dominating and defeating those that threaten their identities."